Well, here’s a rather impressive roll call of personnel: Norah Jones, Hope Sandoval, Beth Orton, Margo Price, Rachel Goswell, Vashti Bunyan, Marissa Nadler, Susanne Sundfør, Phoebe Bridgers, Kaela Sinclair, Carice Van Houten, Laetitia Sadier and Lucinda Williams. There’s no doubting Mercury Rev when they get on the blower to book a few guest artists for their new LP. And do they ever put on a show. 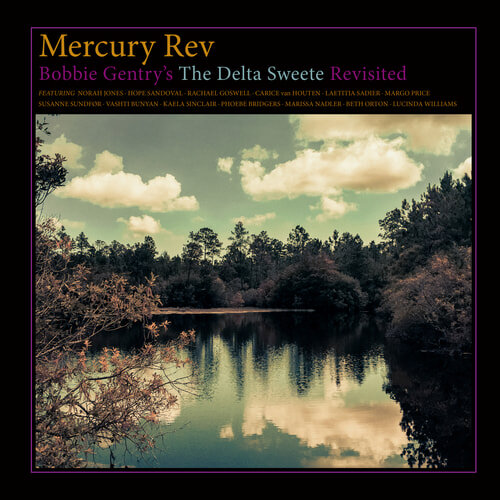 Bobbie Gentry’s The Delta Sweete Revisited delves into a singular piece of American popular music, a 1968 concept album that mixes swamp blues with uptown orchestration and R&B. Bobbie Gentry was one of the true auteurs of her era. She wrote and produced her own material, and was an avowed feminist in the patriarchal world of Country music. The Delta Sweete was her second album, and a follow up to her biggest hit, ‘Ode to Billie Joe’, which topped the Billboard charts for three weeks in the summer of love. Set in rural Mississippi, the song tells the story of Billie Joe McAllister, who jumped off the Tallahatchie Bridge. Or rather, it doesn’t quite tell us the story. Instead, the song’s narrator, a young woman who is assumed to have been in some kind of romantic relationship with Billie Joe, relates the moment at the dinner table when she hears the news of his suicide. Her family dissect the various bits of gossip they have recently encountered regarding the young man, and calmly and politely eat their black-eyed peas and enquire why she is off her food today. It’s quite clear that everyone present knows exactly what has happened. ‘Ode to Billie Joe’ is an understated, unforgettable and delicately furious feat of songwriting. It’s here of course, given a yearning and plaintive interpretation by Lucinda Williams at the album’s close. The preceding songs expand on its themes and instead of answers to the riddle of Billie Joe, we catch glimpses of Gentry’s world. Norah Jones gives a sweltering account of the ‘told-you-society / green apple piety’ at the try-outs for the ‘Okolona River Bottom Band’. Carice van Houten takes us to ‘Parchman Farm’, which, card by deadly card, reveals its hand as a murder ballad. We get a psychedelic take on the old-time religion of ‘Sermon’ with Margo Price, itself Gentry’s reworking of the traditional folk hymn ‘God’s Gonna Cut You Down’. Beth Orton waits patiently in a ‘Courtyard’ for the man who built it, who would ‘come to my side / He would if he could’. Not too far away, the ever-explosive Susanne Sundfør plots revenge on the poverty and degradation of ‘Tobacco Road’. And Laetitia Sadier takes the opportunity to show off her vocal range in a performance of the ballad ‘Morning Glory’ so unexpectedly filled with sunshine that you’ll be reaching for your Aviators. I could go on, suffice to say none of the contributors puts a foot wrong. One of the most striking things about this album is how little it sounds like either Bobbie Gentry, or Mercury Rev. There’s no attempt to recreate her distinctive finger-picking guitar style or quirky arrangements, and for their part, the Rev make for generous hosts. Jonathan Donahue and Grasshopper largely restrain themselves from the kind of far-out, cosmic extravaganza that we might have expected, instead building everything around their guest stars’ voices. The cumulative effect is that of an old-time country and western show reimagined as a dreamy, psychedelic, alt-country Opry. The only track that wouldn’t sound out of place on one of their albums, perhaps unsurprisingly, is ‘Refractions’, in which Marissa Nadler dreams she is a bird made of crystal. ‘I had a most distressing dream last night’, she breathes, and you just know that a theremin is coming in over those ghostly strings very soon. Goodbye serves as my one amusement. Now ain’t that bleak? Over the years those words have often been read as a foreshadowing of Gentry’s later rejection of the music industry, a renunciation so complete she makes Scott Walker look as obliging as a puppy in comparison. They’re more than that though, a neat encapsulation of her artistic world, of the stoic indifference of her heroines, and of the casual cruelties of life in Chickasaw County, Mississippi. And who better to deliver them than Bunyan? She and Gentry have much in common. Both were ignored or misunderstood by audiences and critics of the sixties and both finally retreated into silence, although Bunyan’s silence has been broken by a return to music and a remarkable efflorescence of creativity. Bunyan brings the song full circle, from maiden to crone, if you will, and I hope if Vashti Bunyan reads this she won’t take that amiss. By all accounts, she’s a bit of a hippie and will perhaps appreciate the point. Giving the song to such a mature voice gives it a reinvented poignancy. She sounds sad, disappointed, weary but independent and unbowed. She gets it so right. Mercury Rev have curated an album that isn’t all about them and isn’t all about Bobbie Gentry either. It’s a record that stands as a celebration of the trailblazing spirit of figures like Gentry and Bunyan, women who made early inroads into the music industry on their own terms, and it’s a record that comes across as firmly led by their successors. More importantly, it’s pure bloody pleasure from start to finish, a literate, Southern Gothic, backwoods opera with a cast of characters that would give Tennessee Williams or Flannery O’Connor a run for their money. And if you’re unfamiliar with Bobbie Gentry, start here. Take a slice, leave a crumb. Bobbie Gentry’s The Delta Suite Revisited is released on 8th February through Bella union.